Many lawn problems originate from underlying heavy clay, compacted soils, and/or poorly drained soils that may need to be corrected. Perhaps the soil is in good shape but you've noticed lawn problems that are perhaps due to pests, extreme weather conditions, or neglected management. Improved mowing, fertilizing, and watering may be all that's required for acceptable lawn quality in some cases. In other cases more drastic solutions may be required. Once the problem has been identified, the renovation process may begin. Think of renovation as fitting one of three levels: overseeding with little additional work; significant work, but allowing existing grass to remain; or completely removing the existing lawn and starting over. The decision of which level to choose depends on how bad the lawn looks and what caused the problem. For example, if the lawn is just a little thin, overseeding with a quality lawn seed and putting your lawn on a regular fertilization program may be the answer. Seed can be broadcast over thin lawn areas, but the rate of germination drops considerably unless extensive preparation steps are taken. For good germination there needs to be a good soil-to-seed contact. Rake away any dead grass or debris. Dethatchers or vertical mowers can also be used to tear out excess debris prior to overseeding. The other less extreme method is the use of a slit-seeder. This is actually an ideal way to overseed lawns. In addition, slit-seeding could also be done directly through grass and/or weeds killed with the nonselective herbicide glyphosate (Roundup). All of these types of overseeding procedures do not require additional soil modification. 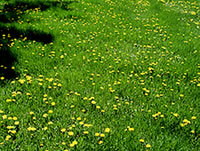 Slit-seeders are useful for lawn renovation projects. Slit-seeders combine vertical mowing with seeding. As the machine goes across the lawn, it opens the soil and deposits seed directly into the soil opening. Most slit-seeders have a roller that helps firm the soil after seeding. Seed is metered at a predetermined rate; it's suggested to apply half the desired seeding rate in one direction and the other half on a second pass perpendicular to the first.